This is the list of the top 100 Major League Baseball players in career games played. Ty Cobb was the first player to reach 3,000 games played. Cobb's record of 3,035 games played lasted for 46 seasons, until Hank Aaron would break the record. 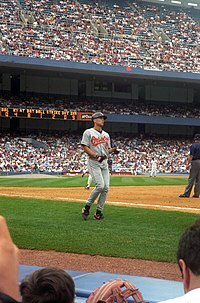 Aaron's record was subsequently broken by Carl Yastrzemski in 1983, and finally broken the following season by Pete Rose, who currently holds the record for most games played at 3,562. Rickey Henderson, Eddie Murray, Stan Musial, and Cal Ripken, Jr. are the only other players to play in over 3,000 career games. Rank Rank amongst leaders in career games played. A blank field indicates a tie. Player (2010 Gs) Number of games played during the 2010 Major League Baseball season. G Total career games played. Cal Ripken Jr. played in 3,001 career games, including a record streak of 2,632 consecutive. Stats updated as of April 23, 2019. "Career Leaders & Records for Games Played". Baseball-Reference.com. This page was last edited on 25 April 2019, at 00:48 (UTC).